So what have i been doing? ... well i have been learning to crochet... like you do when you have nothing more pressing to do! this weekend my sister in law retaught me a few basic stitches (forgot what she had previously shown me) and now i am making at least 2 basic grannie squares a day as i am determined to get the processes involved to sink in. I had bought some yarn earlier in the year in the sale when i caught the knitting bug so had some to nice colours to practice with. I am now addicted but boy do my fingers ache. i think i need to relax my hands more and slow down a bit. I have now completed 10 squares, so nearly a cushion cover. i am hoping to try and change the colours and try some variations when i get more proficient. I'd be interested in hearing what new skills you are hoping to learn before the year is out and of course any crocheting advice for an enthusiastic beginner. Hope your bank holidays were good. Gosh. That reminds me I have half a blanket's worth of squares languishing unloved in a bag somewhere. 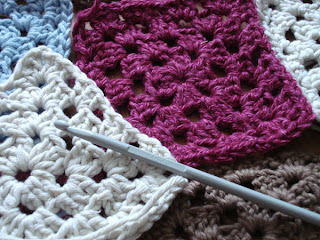 I was so sure I'd finish it for autumn...so I will mostly be trying to remember how to make a granny square toot sweet. oh they are lovely, I'd love to learn to crochet. Hmm, I have the school shoes to get too Ginny and I just know I will leave it till the last minute. Wish I was better at booting myself up the proverbial! 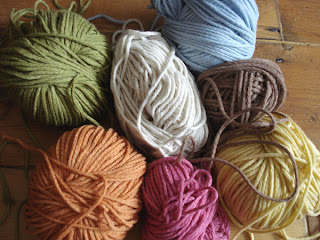 That is some lovely colored yarn you are using. You are doing a great job for a beginner. I have no plans for any new skills to learn at the moment, just working on the old ones. I learnt how to knit this year and crochet is next on my list of new skills, together with learning how to use the manual functions on my camera. We went school shoes shopping the other day - why have most of them got dolls/cars/dogs and goodness knows what in the heel! ?I know my youngest would spend most of the day taking his shoes off to play with the toys and getting told off by his teacher! How on earth have you found the time? I'm SO impressed, I will learn one of these days!! I'm waiting for your book to arrive and then I'm going to begin sewing again by the end of the year. I studied fashion, fabrics and design many moons ago and since discovering the blogging world I'm really itching to get back to making things again. You see, your book will inspire me to sew again. Thank you. A perfect little cushion for a little cat to sit on - maybe? When I have loads to do I usually find something else to do too! I used to crochet many years ago and I may have a go at making a ripple blanket like I have seen on so many people's blogs. I also want to learn how to quilt. I would quite like to learn another couple of languages too - French and Japanese. I think I am pushing it a bit though. I still have school uniform to get and a pile of ironing as high as the ceiling! Following that success, I crocheted a red and black beret. I was the only 17 year old in Newton Abbot with a beret and tennis ball bag to match ..LOL! The crochet book which I used was so simple to understand.I found one on ebay recently and promptly bought it as I had to teach my mum and sister to crochet, a few weeks ago! What a lovely post - and a lovely blog to stumble on. I've spent a happy hour looking through, and love the sound of the vintage and handmade fair. I love to crochet, it's incredibly relaxing. I taught myself from the Harmony Guide to Crochet a couple of years back, but I'm still trying to get time to make enough squares for a blanket. I'm addicted to making flowers, so I get sidetracked! I've just learnt to knit yay! I'm back in the UK for Christmas and am hoping to learn to crochet from my mum. I'm hopeless at trying these things with a book! Looking forward to the book coming out - a perfect gift for Christmas from a UK relative!!! Well you are an inspiration to all... You live life to the full!! Funny that.. I have flirted with the idea of learning how to crochet. I inherited my mother's crochet needles but not her skills alas.. I might just bite the bullet and have a go.. I learnt how to make felt last year.. that was great fun and I would love to teach others.. So glad the cat was reunited. My next project is learn to crochet. Thanks for your comment Ginny - how sad about your Chil-daw mannequin. I logged into your blog earlier and then got called away - 3 hours later your blog is still on my screen and I had your message to read, too! Looking forward to meeting you - I see from the floorplan that we'll be 'neighbours'. Exciting, isn't it! Hi Ginny thanks for your comment. I started crocheting last night, how tough is it!! I'm getting there, though I'm pretty sure I was making my own stitches up! I imagine there to be a lot of hand cramp involved. I'm not sure I will make the fair, but thought I should support you girls with a bit of advertising! Now you really should get on with your crocheting! Crochet and knitting look so lovely when Someone else is doing it! I am looking forward to learning how to use my new Gocco myself, and get my letterpress properly started. Hi Ginny, I don't know if you remember, but you recently left a comment on my blog when I recently learned to crochet - you said at the time that you hadn't quite grasped it, so well done! - The granny squares are addictive and changing colour is easy - I think I have done about 17 now towards my blanket. Natalie x P.S - I think household, wifely, and motherly duties should have been at the top of your list, its a wonder we mums/wives get anything else done! Why is crochet so addictive!? I am obsessed with making rose corsages! I have recently tried both feltmaking and spinning - I don't think that I have an aptitude for either but it is great to try new things.